The kitten is trembling with excitement over his newest toy – what will it do? Will it eat him? Run away? Fly up in the air? 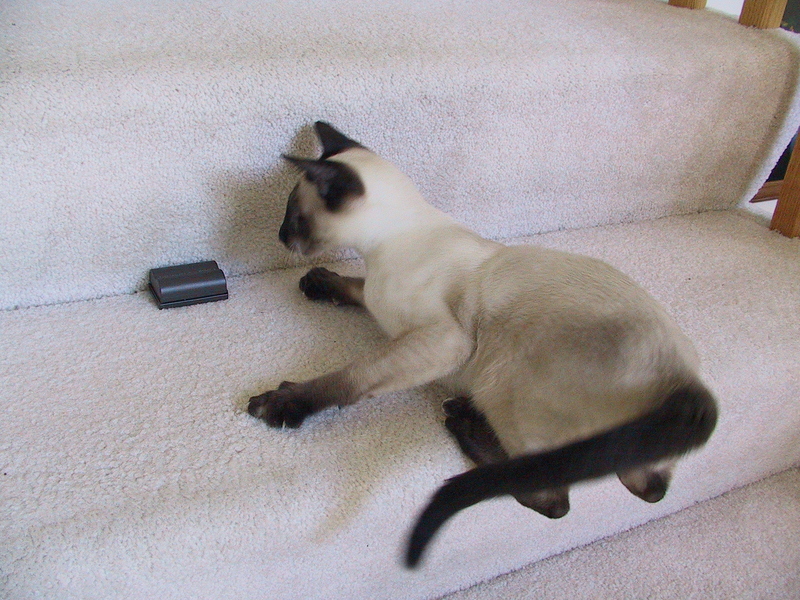 Note how he’s hanging onto the edge of the stair with those big claws of his as he chases after a camera battery that he dug out of my photo bag. Word for tomorrow – ANGRY. If you prefer to work ahead, see the list for the week under “A Word A Day”. That they do. All three have passed away and I miss them all. That’s too funny. Too bad you didn’t have a way to make it move suddenly. Ha ha. I know! He would have jumped straight up in the air if that had moved. I can’t figure out why he was so fascinated with it – those batteries are like bricks. Jaimie enjoyed this one a lot! She loves watching cats and dogs at play. They are so much fun to watch. I love them too. That is one pampered puss! Such beautiful fur! He was gorgeous. However, the song was not done quite right. You have to sing it at the top of your lungs, bellowing each syllable into your human’s ear. THAT’S how a Siamese would really do it. Deafness is part of being owned by them. There are two volumes on the control panel – extremely loud bellow louder. I know exactly the movement you are describing, it’s like when two kittens are rough-housing, and they’re ready to pounce. That’s exactly what he’s doing. I love the quiver on that little nose right before he moves.